We got off the plane and we wasted no time and headed to the French Quarter, our first lunch spot: Coop’s Place. New Orleans is saturated with bar one after another especially on Bourbon Street. Unlike any other bar I’ve ever been to, the food is amazing at Coop’s Place and I mean real food like entrees, not just you’re average starters like nachos and fries. It’s a bar that takes their food as equally serious and love as their alcohol menu. I wanted to try everything but knowing I was going to be in New Orleans for a few days I had calmed myself and ordered, you guessed it Fried Chicken! 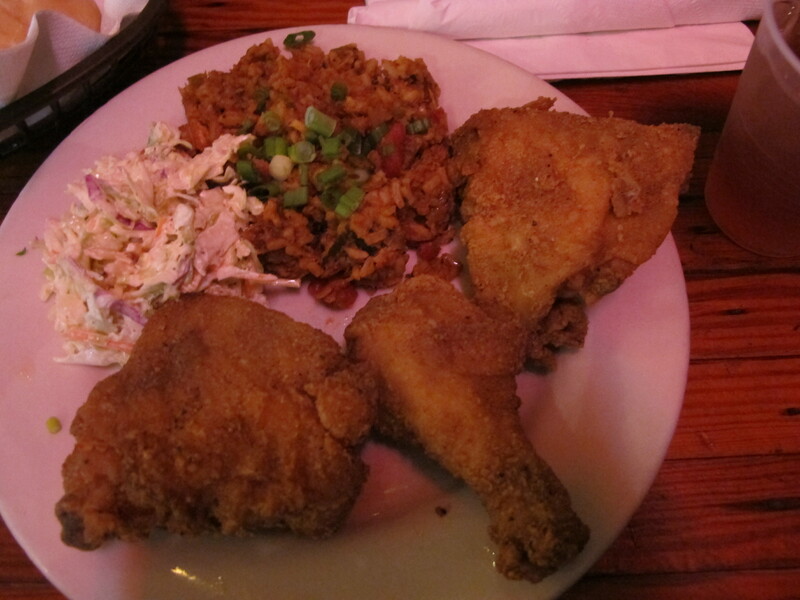 It came with slaw and jambalaya and 3 pieces of fried chicken for only $10.95! An amazing deal and amazingly good! The fried chicken was lightly battered and seasoned so well, without needing any excess condiments like ketchup, hot sauce or honey, it was by far one of the best fried chickens I’ve ever had. Later that afternoon, after admiring some Gallier architecture which Angelina Jolie and Brad Pitt apparently owns an estate in the French Quarter, we had our afternoon coffee and beignet at the famous Cafe Du Monde. It may appear to be a touristy spot but it is a confectionery- java heaven. Cafe Du Monde is open 24 hours and it is brilliant for a breakfast, lunch, dinner and everything in between kind of pick me up. The menu is rather simple with less than essentially two things on the menu: cafe au lait and beignets, the pairing is a match made in heaven. 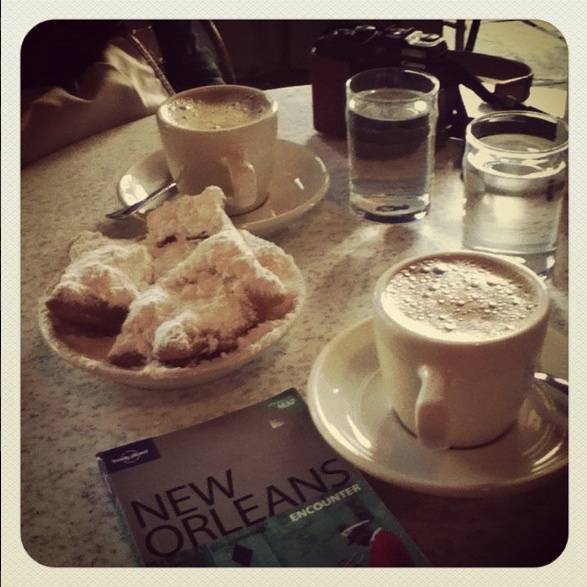 Unlike the orange tin can of ground coffee of Cafe Du Monde you can purchase at a supermarket, the coffee and cafe au lait is exceptionally good and without the need to add any sugar, the sugar powder dusted on the beignets sweetens the coffee. Epiphany is the start to carnival season leading to Mardi Gras also known as Fat Tuesday (February 22). The one thing you eat is the King Cake, which is a tri- colored (purple, yellow and green) cinnamon like cake. In a king cake there is usually a plastic doll hidden in the cake and whoever finds it is a symbol for luck. I had a slice of king cake but no doll, nonetheless, I felt pretty lucky. We started the day at 9am and joined a local kayak tour with Kayak-iti-yat and did a 4 hour trip on the historic Bayou St. John. Our tour guide Sonny was a friendly fellow and gave us an incredible tour with historic facts, on the local hot spots and the appreciation of wildlife. Highly recommended for anyone who visits New Orleans and wants to escape the touristy areas. We made our way to Parkway Bakery and Tavern after our 4 hours kayak trip which was around the corner and was a well- deserved lunch of po boys – oh boy! and chili cheese fries – hell yes! 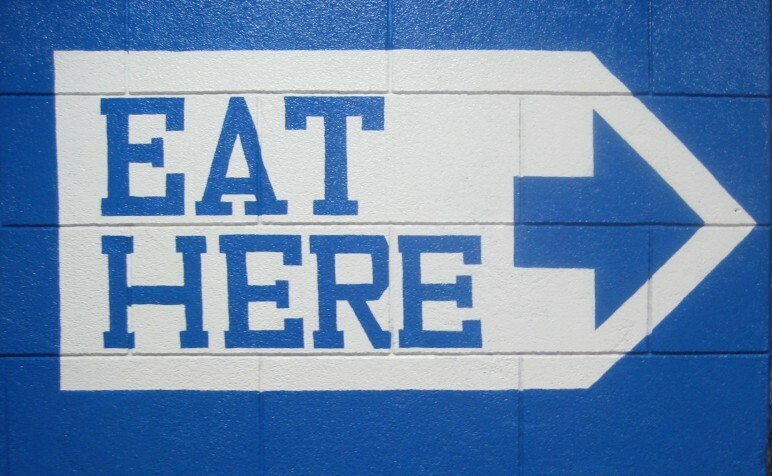 This place is amazing, the food and the decor. There is indoor and outdoor seating and for a fine day in the mid-60s in January, who would not opt for the outdoor seating? Parkway Bakery and Tavern was one of the many who were devastated during the Hurricane Katrina. There were photos of the restaurant submerged into water but I am glad they have recovered and are doing well, even President Obama made a visit shortly after his inauguration. We ordered the catfish po-boy and the grilled smoked hot sausage pork link po-boy and an order of chili cheese fries along with two vintage bottled of Barq root beer. I am drooling and getting very giddy as I am writing and recollecting memories of Parkway Bakery. If this place existed in New York City and specifically in Brooklyn, it would be packed with hipsters but gladly it was not, just locals, food fiends, and families. The ceiling fan, the vintage wall bottle opener, to the paper wrapped sandwiches and paper boat fries, what makes this place so cool is of course the food but also the great southern hospitality and the authenticity and you cannot get this anywhere else other than making a visit here. My co-worker had recommended to me to visit the Vietnamese farmer’s market because I would like it since I work for one! This time around I really wanted to go to Asia and Vietnam was on top of my list but since my sister and I were both expecting the arrival of our second niece we couldn’t travel out of the country with all due respect to our brother..ugh but I’m glad we literally came back in time after our trip to New Orleans and welcomed, Alyson Nora Yeung to the family (January 9, 2012 – more January babies in the Yeung Family – yipee!). Oddly, there is a large population of Vietnamese in New Orleans since the 1970s as refugees and what they brought with them from Vietnam, of course is their cuisine and this community farmers market. There were live poultry, fresh caught fish, and scents of lemon grass. Around the corner, we stopped by for a bowl of Pho for breakfast and got a to- go Vietnamese po boy/ bånh mi. Later in the afternoon, we drove into the inner city for a swamp tour in the honey islands and every now and again I see this poster in New York City of the history channel, Swamp People I think of the lady who has a peacock, two dozens of chickens, a dog and a cat as an animal sanctuary, this makes a lot of sense in why it’s a reality tv show. The drive to and back from the swamp was just absolutely magnificent. The drive was across a bridge which the view was just clouds and a body of water, no billboards, no flashy lights, no industrial buildings, it was the purest and scenic view we both intake while driving, the beauty of road trip. That evening was apparently a huge football game, the home team, the Saints were playing at the Superdome in their home turf..who knew! We went to the French Quarters for dinner and it was paraded with Saints fans, everywhere you turned people had Saints jerseys on and every restaurant/ bar you went to had the football channel on. For someone who never follows sports nor interested other than the Olympic games this was extremely bizarre to us. Although, I’m glad we chose to have dinner at a cafeteria style restaurant, Mother’s, which was the perfect kind of restaurant to go to without any comprehension of the game. Although, the people you are surrounded by and the cheerful spirit from the fans, it’s hard not to get into the game as it is rather contagious. For every touch down the Saints made, a staff at Mother’s would rang the bell. They’re the different kind of fans and I must say very sober which I find very ironic considering all the bars and the liberty to drink on the streets. I was getting to understand football a little more but I was fixated more on the food which we ordered a feast! It was our last night before we headed back to the frigid cold and we celebrated with a table full with softshell crabs, crawfish etouffee, famous baked ham, collard greens, grits, and lemonade and bread pudding! The food was a little salty for my taste, sorry for the criticism – but the vibe of the restaurant on a game night is definitely a winner. One of my favorite things to do when I’m on vacation is watching television in bed and it’s usually at a hotel since we don’t have that kind of luxury back home, so we stayed in a little later. We went back to town, which the football madness continues with their college teams Louisiana State University vs. Alabama. By this time we knew it was time to head back to reality but before heading home, the last item I needed to have was a muffaletta which is an Italian inspired New Orleans kind of wheeled sandwich. The place my friend had recommended, Central Grocery was closed on Sunday which was lame and so disappointing, so we went next door to a place called Frank’s for their muffaletta which probably is not as good as Central Grocery but will do for this first visit. Every travel is a growing experience and surely my waist but I felt like I really connected with my heritage as an Asian American, and nothing is more American than football. I had the privilege to take this trip with my sister and ate our way through this wonderful city. The aftermath of Hurricane Katrina and the impact of the Gulf Coast oil spilled have definitely scorned the city but similarly to New York City, the strength of the communities and the uniqueness is what makes New Orleans so special and I highly encourage everyone to visit for a taste of the warm Southern hospitality. Until my next chapter in travels, stay tuned for my whereabouts in my home New York City. Happy Mardi Gras!